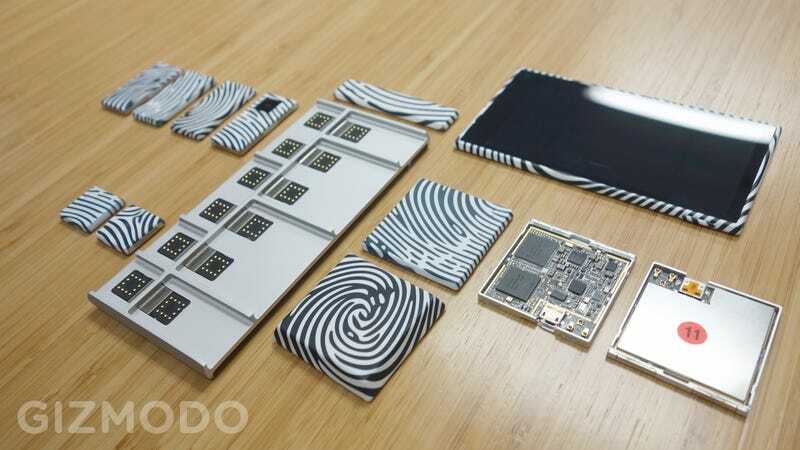 We won’t see Google’s awesome Project Ara smartphone till 2016, and there’s a surprisingly simple reason for that. It fell to pieces when people dropped it. Oh, it’s not as bad as it sounds: the phone’s made of removable modules, after all. It’s not like the phone actually broke. It sounds like Google’s existing idea of using electropermanent magnets to hold each module in place wasn’t enough to keep them from falling out. Thus the delay, while Google figures out an alternate idea. The idea behind Project Ara is that you’d have a phone that you could modify or upgrade anytime you want, just by sliding modules in and out of an “endoskeleton” frame that acts as a network for them to act like a single computer. Not unlike a desktop PC’s motherboard, you could simply slot in new components—including different processors, cellular radios, cameras, displays, multiple batteries, even exotic components like pollution sensors or tools for the military. Google needed something to keep those modules securely nestled into the frame, though, and yet let you swap them out at a moment’s notice. The company’s ATAP research group hit upon electropermanent magnets as the solution. You’d just press a button on the touchscreen to lock them into place with a (relatively) strong magnetic field. But in demonstrations to the press (including me), Google seemed to have a hell of a time getting the magnets working. I’ve seen Ara in person twice now without getting to actually try them out. Perhaps this was why. Anyhow, the Project Ara team says it is now “testing a signature experience to attach/detach modules,” whatever that means. I’m definitely looking forward to checking it out, because I still think a modular phone sounds pretty damn awesome. Update: The official Project Ara Twitter account now claims that #FailedTheDropTest was a joke. We’re not sure what to believe now.